Franco Cervi celebrating his goal for Benfica. The Champions League is back, the qualifiers that is to say and Franco CERVI gave his team the win. In leg 1 of the third qualifying round, Benfica were at home against Turkish club Fenerbahce and three Argentine players were in the starting eleven. Eduardo SALVIO, Facundo FERREYRA and Franco CERVI all started with German CONTI an unused substitute on the bench. The ball found the former Rosario Central man who controlled it and under tight pressure shot with his left footo put it into the net. Pourtau, Balerdi, ALmendra, Maroni ok. But Colidio?! Probably becuause he was the only before known player for the jury. The final win is not that important as the fact Argentina were able to dominate and play collective football with typical shaver’s slip ups but having the initiative and arguments. There were down moments as first half against Uruguay but after morale was boosted by coaches they were good even with 10 players. Although I appreciate India won , please don’t exaagerate stuff. You are soon becoming Kid next version on Mundo. Ughhhhhhh this is not a Dating site, LOL. By far one of the weirdest comment ever seen here in MUNDO. Argentina the winner. They deserved that. With boosted morale they were far best team in this tournament. Second half they have played like real Argentina. As team. No big star but team. Almendra runs and Maroni dribbles makes difference but it’s first of all collective success. 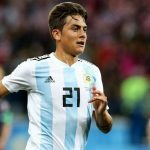 Leo Balerdi is another outstanding Argentina young CB. RB Mura one of best our players. Everyone good only Colidio below expectations. Though he scored important goal. Having the game under control they should have scored. extra time. very good football so far in second half. We are dominating totally and there are opportunities. Play quite good though without enough opportunities. Too many stupid fouls that provoke opportunities for Russia. I think our problem is final third: Barreal our best player in first 3 games disappeared, Colidio is probably not that that talented as our previous strikers while Maroni not type of leader. And I don’t know what happend to Almendra long shoots. He was good on that, scored beautifull one in Boca preseason… Good on taclking and pressing. Coldio instead of Gaich. 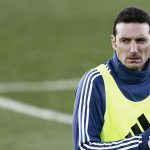 Ayala to play as only straight red card eliminates of next game. Boca vs Libertad this night in another duel of 1/8 CL. Two days to River – Racing clash in Copa Libertadores. Pol Fernandez joining La Academia is to me maybe most interesting transfer in Superliga. I don’t know he will play against Millonarios but sooner or later it must be vital reinforcment. After win over Cerezo Osaka in Suruga Bank Cup Independiente equalized Boca in number of international titles (18). Estudiantes won with title defender Gremio 2:1 in first leg of 1/8 Copa Libertadores. Kannemann scored for Gremio. Few young players in Estu eleven. No.5 Ascacibar successor Gomez, LB Erquiaga, LM Pellegrini, Lucas Rodriguez and forward Apaolaza. Poor guy. Seems everybody doesn’t want to know anything about him. With Aguero in stunning form under Guardiola (recently scoring his 200th Man City goal), and rising strikers like Icardi, Lauturo Martinez, and others, I don’t really want to see him wear the Albiceleste jersey again either. Mate I don’t understand why people attacking aguero for me he is world class strike. Personally I believe Argentina managers misused him except Tata martino . Even english man admitted that he will have aguero over Kane. Aguero is joy to watching him in premier league they really appreciate him to have him in premier league. I do agree Cervi is one of the new crop i like the most. Cervi, like Angel Correa is a true talent that may become very important for the national team for many years to come. Skilled with the ball, defensively disciplined and incredibly versatile. I remember Gonzalo praising him (even more so than celso) when he was playing midfield for Rosario and since moving to benfica he’s played everywhere on the left side (midfield, attacking midfield and forward) and excelled in all 3 positions (although he’s most effective as a forward). In Central he impressed me more than Lo Celso. You never know who of the two will develope better but somehow I really relished of Cervi playing. More than Lo Celso. Both have a lot to show.